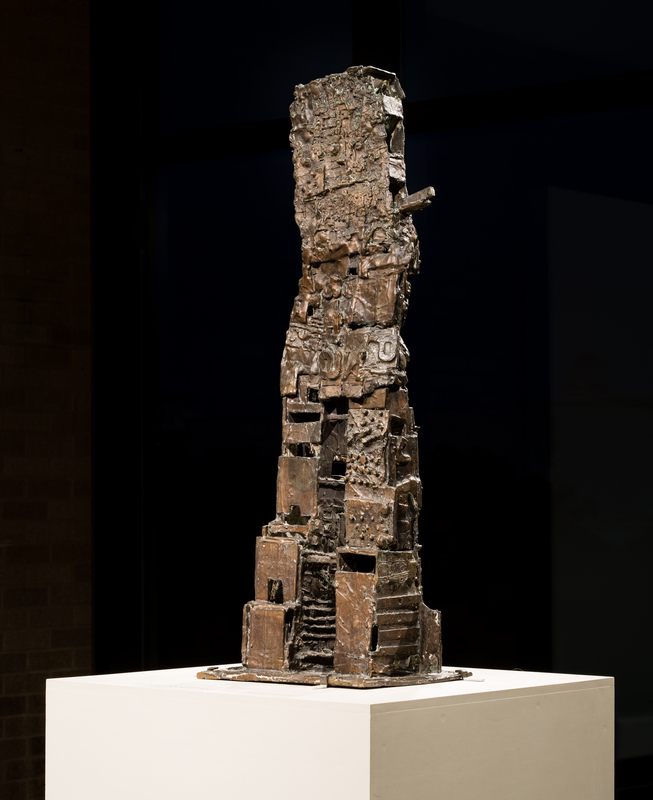 Figure is one in a series of sculptures made from old machine parts and cast-off technology components, which Paolozzi pressed into slabs of wax. These were later cast in bronze and welded together to create human-like robotic sculptures. Shortly after viewing this piece, I began constructing a narrative in my mind. To me, Figure resembles a robot from the 1950-60s television and film era that is in the midst of a world ravaged by war. Its upper body has been almost completely destroyed with only the lower torso and legs remaining, and yet its programming has remained in tact. Figure was programmed to fight for peace and justice and an end to war. Despite taking heavy damage and in the face of impossible odds, it continues its mission of peace one belabored step at a time. This piece was composed for the Sound in Sculpture Concert Series and was premiered at the Texas Performing Arts lobby on the campus of UT Austin.